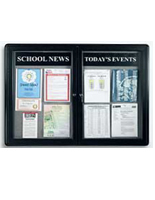 These fabric covered bulletin boards, also known as enclosed fabric boards, are often used for displaying information in school classrooms. 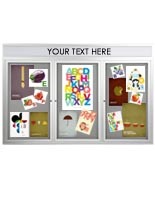 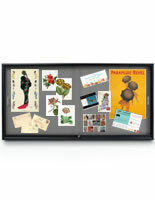 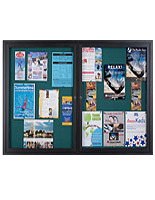 Large bulletin boards and letter boards are ideal for public posts. 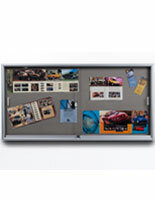 These large enclosed fabric bulletin boards come with fabric covered surfaces instead of plain cork board surface for a clean bright presentation style. 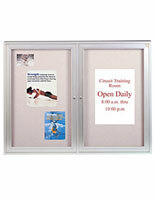 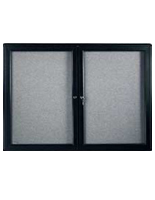 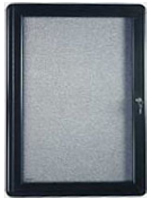 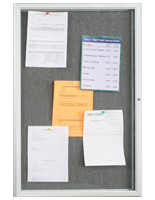 Each locking bulletin board has swing open doors made with plastic windows and a locking component for security. 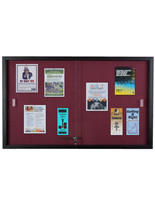 These sliding bulletin boards are professional grade and great for raising the attenion of students, employees, members or any other potential viewers. 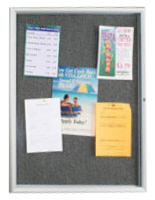 This large bulletin board can be used for posting important flyers, news and activities in classrooms. 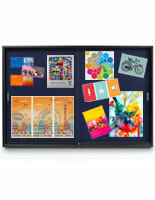 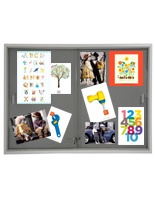 This locking bulletin board is also a great way to decorate the boring classroom. 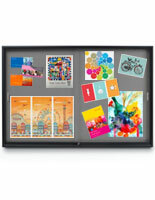 What are the top features for classroom bulletin boards? 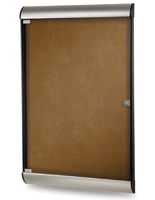 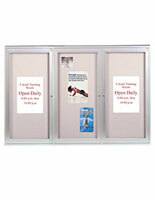 Swing open doors and plastic panels help protect important information. 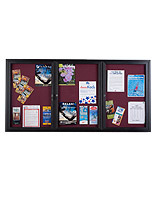 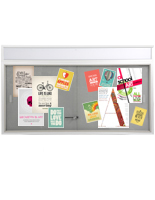 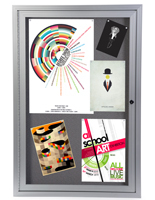 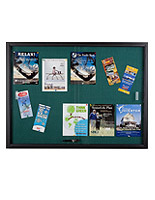 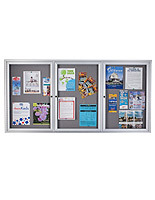 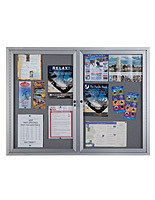 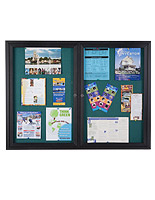 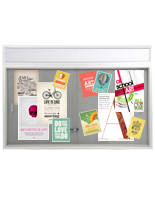 These large bulletin boards are ideal for posting flyers and information. 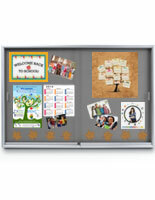 This classroom display board is a great teaching tool for teachers to post assignments and homework. 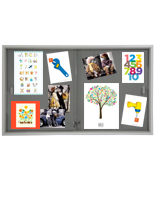 This locking bulletin board raises students attention and encourages them to participate activities. 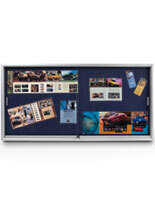 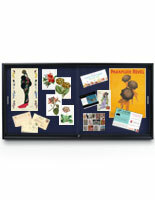 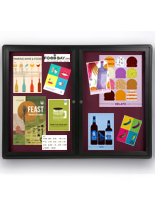 There are many other presentation necessities that are all offered by Displays2go. 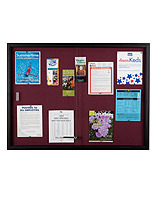 Choose from our large selection classroom Bulletin Boards and lobby directories for all your lobby essential needs. 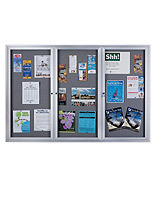 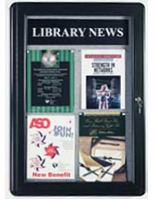 Our inventory also includes display cases, public posts, stanchions, document organizers, floorstanding letter boards and many more informational directories. 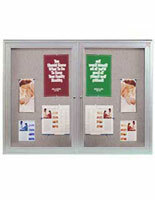 We offer display cases including glass showcases, tower display cases and counter height display case models. 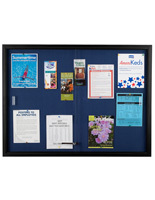 To find the right fabric boards or other lobby necessities that meets your point of purchase display needs, click above to view our entire selection, or see our main shopping page Displays2go. 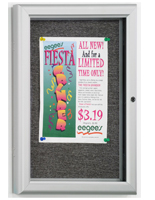 What can you use an aluminum frame ecnlosed cork board for? 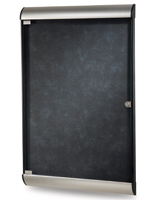 Plastic Assembly is our specialty and at our large facility located in Fall River, MA we carry over thousands of in stock displays. 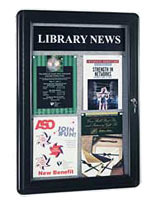 View our home page for products including: poster holders, sign holders, outdoor displays, display cases, discounted picture frames, slatwall fixtures, entry box products, retail displays, pop displays, display fixtures, finanical marketing displays, podiums, magazine racks for walls, stanchions, and custom displays.